1:04 a.m. — Police investigated a suspicious car in the area of Gill and Payne avenues. Officers determined the driver had left the door open. 8:27 a.m. — An employer in the 1400 block of Baehr Street told police one of his employees didn’t show up for work, and that the employer’s truck was at the house with the back door wide open. Police determined the employee was sleeping in the back room. 9:54 a.m. — Officers investigated a complaint about music being played too loudly in the 400 block of Fifth Avenue. 10:12 a.m. — Officers did a welfare check on a man in the 900 block of East Walnut Street. 10:24 .m. — Police received a report of a German Shepard running loose in the 600 block of South Union Street. They did not find the dog. 11:04 a.m. — Police received a report that someone dropped off a paper prescription at Drug Mart and the store employees had been unable to find it. 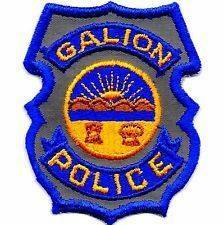 11:38 a.m. — Police did a welfare check in the 500 block of Galion Arms Apartment. 12:24 p.m. — A customer in the drive-thru at McDonald’s called police after seeing a child who was not restrained in the car seat in the vehicle in the same line. 1:57 p.m. — Brandon Robison was arrested on a felony warrant by parole officers in the 400 block of South Boston Street. 2:07 p.m. — During a warrant check, a arrest was made in the 500 block of East Church Street. 2:28 p.m. — After receiving a report of a large metal object in the water at Amann Reservoir, the fire department recovered a trash can. 4:11 p.m. — Police received a report of a man sitting in a vehicle drinking beer in the 700 block of Harding Way West. There were not able to find the man. 4:11 p. m. — Police arrested a man in the 500 block of Virgil Street for U.S. Marshalls on charges of disorderly conduct and failure to appear. 4:17 p.m. — A resident in the 400 block of Second Avenue reported a lawn mower stolen from a garage. 4:28 p.m. — A vehicle hit a sign and got stuck in a ditch in the area of Dawsett Avenue and Ohio 19. 4:43 p.m. — A vehicle was towed from the 300 block of West Church Street for not being moved for 24 hours. 6:42 p.m. — Officers assisted an out-of-state police department in contacting family members on Carmel Avenue about a death. 7:59 p.m. — Police received a report about a dog locked in a vehicle at Ralphie’s, 451 Portland Way North. The owner of the car was advised of the complaint. The dog appeared to be OK, officers said. 8:33 p.m. — Police were called about a reckless driver in the area of Ohio 602 and Ohio 19. They couldn’t find the vehicle. 9:40 p.m. — Police responded a report of kids shooting a gun in the 500 block of John Street. The kids were reportedly shooting and “air-soft” gun at a tarp and were advised of relevant city ordinance. 10:10 p.m. — A man reported that he backed into a vehicle in the 600 block of Hess Street. 11:15 p.m. — After responding to a disturbance in the 400 block of South Street, officers issued several warnings about disorderly conduct. 1:41 a.m. — Officers did a welfare check on a resident in the 200 block of First Avenue. 2:31 a.m. — Police investigated a report of a dog “barking for about an hour” near the entrance of South Park, off Wilson Avenue. 8:14 a.m. — An employee at Burger King reported that a vehicle had just run into the building. no one was injured. 9:42 a.m. — A report of a large dog running loose and scaring children in the 900 block of East Walnut was received. 5:26 p.m. — A fight between juveniles at Circle K was stopped. 6:58 p.m. — Emergency personnel responded to an attempted suicide on Smith Street. 7:24 p.m. — Police responded to a reported domestic dispute in the 500 block of First Avenue. A man at the resident was told to pack his belongings and leave. 7:41 p.m. — Officers performed a welfare check in the 100 block of West Church Street. 8:15 p.m. — Some stones were removed from an alley in the 100 block of South Market Street. 9:44 p.m. — Police talked to a man in the area of Wilson Avenue and South Market Street about the illegality of shooting off fireworks. 1:56 a.m. — Following a traffic stop in the area of East Walnut Street and Sixth Avenue, police cited a passenger for possession of a controlled substance. 2:55 a.m. — After responding to a reported domestic dispute in the 700 block of South Boston Street, two people were giving warnings for disorderly conduct. 6:32 a.m. — A 31-year-old man was taken to the Crawford County jail after being picked up for trespassing at a business in the 800 block of Harding Way East. 3:51 p.m. — Police contacted a resident in the 200 block of Gill Avenue about a death in another state. 6:22 p.m. — Officers investigated a domestic dispute in the 700 block of Clay Street. 7:06 p.m. — A car ran crashed into Firelands Federal Credit Union, 1222 Ohio 598. A caller told police a man was slumped over the steering wheel. The driver was taken to Galion Community Hospital and the vehicle was towed. The driver received a citation, but no other information was available. 9:11 p.m. — Officers arrested on person after a domestic dispute in the area of Jefferson Street and Harding Way West. 11:50 a.m. — Officers assisted Life Support in the 1600 block of Marion Rd. 12:58 p.m. — A report of a trespasser in the 200 block of Inez St was investigated. 1:35 p.m. — Officers assisted with a vehicle lock out in the 1800 block of E Mansfield St.
3:21 p.m. — A private property accident at Medicine Shoppe was investigated. 4:27 p.m. — A parking citation for junk vehicles was issued in the 400 block of W. Rensselaer Street. 4:38 p.m. — Two parking citations were issued in the 400 block of W. Rensselaer Street for parking over 48 hours. 4:49 p.m. — A resident at Woodbine Apartments reported a package stolen from his mail box. 4:51 p.m. — A two-vehicle accident was investigated in the area of Mansfield and Lane Street. 5:03 p.m. — A report of a suspicious person in the area of Lane and Charles Street was investigated. 6:14 p.m. — An accident in the area of Walnut and Short Street was investigated. A 23-year-old girl was was arrested on charges of Driving Under Suspension, OVI, and Reckless Operation. She was issued paperwork to appear in court and transported to the Crawford County Justice Center to be held on a probation violation. 6:57 p.m. — A parking complaint in the 400 block of E. Lucas Street was investigated. 7:03 p.m. — A Rogers Street resident reported his blue Mongoose bicycle stolen today. 8:34 p.m. — An abandoned bicycle found in the 500 block of Failor Street was brought to the Police Department. 10:56 p.m. — A report of fireworks in the Dudley St. area was investigated. 10:57 p.m. — A report of suspicious people in the 500 block of W. Charles St. was investigated. 11:37 p.m. — A resident in the 900 block of W. Mansfield St. reported the door to her home vandalized. 12:06 a.m. — Officers on patrol investigated a vehicle parked at Aumiller Park. 12:11 a.m. — A report of people yelling in the 500 block of Failor St. was investigated. 12:29 a.m. — Officers assisted a disgruntled intoxicated male in City Lot 3. He was sent on his way with friends. 12:41 a.m. — A report of an unwanted female at a residence in the 500 block of Failor St. was investigated. She was warned against trespass. 2:58 a.m. — A report of a woman yelling in the Dean St. area was investigated. Officers checked the area and found no one in need of assistance. 3:07 a.m. — Officers mediated a domestic issue in the 200 block of Dudley St.
3:12 a.m. — A male on Washington Square reported being threatened. 4:49 a.m. — Officers on patrol checked on a female standing in the area of W. Warren St. and Clark St. She was found to be waiting for a ride. 5:54 a.m. — Officers assisted a male on station with and issue he was having. 6:27 a.m. — A male staying at Pinewood Court reported his bicycle stolen overnight. 8:10 a.m. — A vehicle vandalized in the 100 block of N. Highland was reported. 9:09 a.m. — Officers picked up a piece of drug paraphernalia and destroyed it from the 300 block of Osman St.
10:12 a.m. — Officers are investigating after a 47yr old male and a 34yr old female apparently overdosed in the 500 block of Rogers St. They were treated at Bucyrus Community Hospital. 11:35 a.m. — A private property accident was investigated at Wendy’s. 12:37 p.m. — Officers assisted with a landlord, tenant dispute in the 400 block of Charlotte St.
1:43 p.m. — Officers checked on a suspicious vehicle in the 1200 block of John St. The vehicle belonged to a resident in that area. 1:50 p.m. — A two car non-injury accident was investigated on Sandusky at Oakwood St.
2:28 p.m. — Officers checked the welfare of two young children walking along Hopley Avenue without parents. 2:31 p.m. — Officers mediated a landlord and tenant dispute in the 1500 block of E. Mansfield Street. 2:34 p.m. — A wallet found at the Clark Station was turned in to the Police Department. safekeeping. 5:20 p.m. — Officers are investigating a report of a robbery in the 300 block of E. Mansfield St. A 27-years old Bucyrus man is being held on suspicion of robbery after a man sitting in his vehicle in the area was forced out of the vehicle by knife point and his money, credit cards and cell phone were stolen. The victim was not harmed. Officers are still investigating. 5:37 p.m. — A domestic disturbance in the 200 block of S. Lane Street was investigated. 6:47 p.m. — A report of someone trespassing in the 200 block of S. Lane Street was investigated. 7:29 p.m. — Rodney Cornell, 50, was arrested on a charge of disorderly conduct. He was issued a minor misdemeanor citation and transported to the Crawford County Justice Center. 9:14 p.m. — A resident in the 1100 block of E. Mansfield Street reported his blue 10 speed bicycle stolen. 11:10 p.m. — A domestic disturbance in the 300 block of W. Mary Street was investigated. 11:18 p.m. — A 9-1-1 hang up call was investigated in the 800 block of Cleland Street. 11:51 p.m. — A disturbance in the 400 block of Heritage Circle was investigated. 11:54 p.m. — A resident in the 500 block of Failor Street reported being assaulted by someone he knows. 12:04 a.m. — A disturbance at Bucyrus Plaza was investigated. 12:08 a.m. — A warning for trespassing at Aumiller Pool was issued. 12:54 a.m. — Officers investigated a report of a drunken male singing loudly in the 600 block of N. Lane Street. The subject was at home and advised he would keep it down. 1:01 a.m. — A report of fireworks in the area of Hopley and John Street was investigated. 1:57 a.m. — A resident in the 800 block of Maple Street reported someone banging on the back windows at his residence. Officers did not locate anyone in the area. 7:32 a.m. — Officers picked up a toy gun behind Walmart. 8:26 a.m. — A manhole cover was recovered and placed back in the 600 block of S. Spring St.
11:11 a.m. — A report of a disturbance in the 500 block of Prospect St. was investigated. 12:11 p.m. — A false alarm was received in the 1500 block of Marion Rd. 1:01 p.m. — A report of a speeder in the Bucyrus Plaza area was investigated. 3:00 p.m. — A theft report was taken at the Police Department. 3:11 p.m. — A report of a suspicious person in the area of East and Southern was investigated. 6:30 p.m. — A report of people swimming in the reservoir was investigated. 7:40 p.m. — A domestic disturbance in the 1400 block of Whetstone Street was investigated. 8:13 p.m. — After a traffic stop in the 600 block of Hopley Avenue, a 34-year-old man was arrested on charges of possession of marijuana, possession of marijuana paraphernalia, and driving under suspension. A passenger was transported to the Crawford County Justice Center for possible felony charges of possession of drugs. 8:34 p.m. — A report of a young child from a vehicle parked in the area walking around the 100 block of Washington Square without supervision was investigated. The vehicle and child were gone from the area before officers’ arrival. 8:40 p.m. — A report of loud music in the area of S. Walnut Street was investigated. 8:47 p.m. — A report of loud music in the area of Bucyrus Plaza was investigated. 10:19 p.m. — A resident in the 300 block of E. Lucas Street reported a vehicle vandalized at the residence. 10:46 p.m. — A motorist in the area of Walnut and Oakwood Avenue reported something falling on her vehicle. Officers checked the area and were unable to locate anything. 10:57 p.m. — A resident in the 400 block of E. Rensselaer Street reported harassing messages from someone she knows. 12:21 a.m. — A report of a suspicious vehicle in the 200 block of Dudley Street was investigated. It was a resident who forgot to turn off their dome lights. 4:54 a.m. — Officers investigated a report of a disturbance in the 400 block of E. Warren St.